^ 1.0 1.1 H. Muir. Pentaquark discovery confounds sceptics. New Scientist. 2 July 2003 [2010-01-08]. ^ K. Hicks. Physicists find evidence for an exotic baryon. Ohio University. 23 July 2003 [2010-01-08]. ^ 3.0 3.1 See p. 1124 in C. Amsler et al. (Particle Data Group). Review of particle physics (PDF). Physics Letters B. 2008, 667 (1-5): 1. Bibcode:2008PhLB..667....1A. doi:10.1016/j.physletb.2008.07.018. p decays. Physical Review Letters. 2015, 115 (7). doi:10.1103/PhysRevLett.115.072001. ^ 5.0 5.1 5.2 I. Sample. Large Hadron Collider scientists discover new particles: pentaquarks. The Guardian. 14 July 2015 [2015-07-14]. ^ 6.0 6.1 J. Pochodzalla. Duets of strange quarks. Hadron Physics. 2005: 268. ISBN 161499014X. ^ 7.0 7.1 G. Amit. Pentaquark discovery at LHC shows long-sought new form of matter. New Scientist. 14 July 2015 [2015-07-14]. ^ Gell-Mann, Murray. A Schematic Model of Baryons and Mesons (PDF). Phys. Lett. 1964, 8 (3): 214–215. doi:10.1016/S0031-9163(64)92001-3. 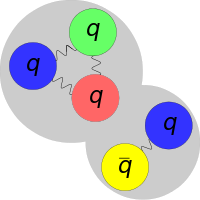 ^ Strottman, D. Multiquark baryons and the MIT bag model. Phys. Rev. D. 1979, 20 (3): 748–767. doi:10.1103/PhysRevD.20.748. ^ Kandice Carter. The Rise and Fall of the Pentaquark. Symmetry Magazine. 2006, 3 (7): 16. (PDF). Journal of Physics G. 2006, 33: 1. Bibcode:2006JPhG...33....1Y. arXiv:astro-ph/0601168. doi:10.1088/0954-3899/33/1/001. ^ D. Diakonov, V. Petrov, and M. Polyakov. Exotic anti-decuplet of baryons: prediction from chiral solitons. Zeitschrift für Physik A. 1997, 359 (3): 305. Bibcode:1997ZPhyA.359..305D. arXiv:hep-ph/9703373. doi:10.1007/s002180050406. ^ T. Nakano et al. (LEPS Collaboration). Evidence of the Θ+ in the γd→K+K−pn reaction. Physical Review C. 2009, 79 (2): 025210. Bibcode:2009PhRvC..79b5210N. arXiv:0812.1035. doi:10.1103/PhysRevC.79.025210. b→J/ψpK− decays. CERN/LHCb. 14 July 2015 [2015-07-14]. ^ P. Rincon. Large Hadron Collider discovers new pentaquark particle. BBC News. 14 July 2015 [2015-07-14]. ^ Where has all the antimatter gone?. CERN/LHCb. 2008 [2015-07-15]. David Whitehouse. Behold the Pentaquark (BBC News). BBC News. 1 July 2003 [2010-01-08]. Thomas E. Browder, Igor R. Klebanov, Daniel R. Marlow. Prospects for Pentaquark Production at Meson Factories. Physics Letters B. 2004, 587: 62. Bibcode:2004PhLB..587...62B. arXiv:hep-ph/0401115. doi:10.1016/j.physletb.2004.03.003. Akio Sugamoto. An Attempt to Study Pentaquark Baryons in String Theory. 2004. arXiv:hep-ph/0404019 [hep-ph]. 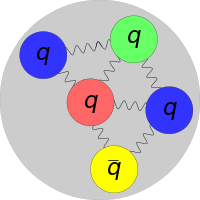 Pentaquark. Journal of Physics: Conference Series. 2005, 9: 183. Bibcode:2005JPhCS...9..183H. arXiv:hep-ex/0412048. doi:10.1088/1742-6596/9/1/035. Mark Peplow. Doubt is Cast on Pentaquarks. Nature. 18 April 2005. doi:10.1038/news050418-1. Maggie McKie. Pentaquark hunt draws blanks. New Scientist. 20 April 2005 [2010-01-08]. Jefferson Lab. Is It Or Isn't It? Pentaquark Debate Heats Up. Space Daily. 21 April 2005 [2010-01-08]. Dmitri Diakonov. Relativistic Mean Field Approximation to Baryons. European Physical Journal A. 2005, 24: 3. Bibcode:2005EPJAS..24a...3D. doi:10.1140/epjad/s2005-05-001-3. Schumacher, R. A. The Rise and Fall of Pentaquarks in Experiments. AIP Conference Proceedings. 2006, 842: 409. arXiv:nucl-ex/0512042. doi:10.1063/1.2220285.